President David called for volunteers to assist with the clean up of the Football Canteen. This is set down for 9.00am on Thursday 9 November 2017. Please note that our next meeting will be held at the Taree West Bowling Club. 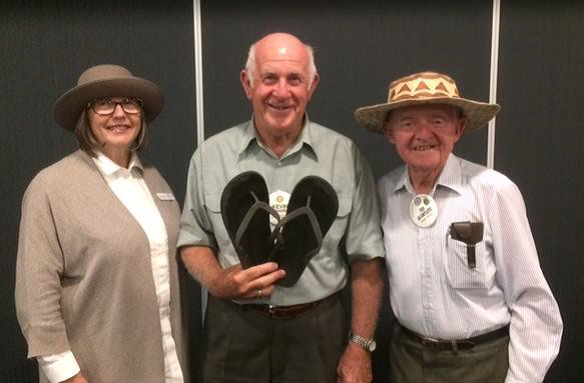 President David and President Elect Ian will give a presentation on their recent trip to Kokoda. Max Carey advised that there will be a working bee next Saturday 11 November 2017 at Rotary Park. Please bring a shovel. (see further notice in this bulletin). Treasurer, Ian Woollard advised that for those members paying their dues 6 monthly, these are now due again. Please pay as soon as possible. He also called for members to seek nominations for next year’s Board. Give it some thought and let him know if you are interested. Murray Difford noted that the Public Speaking Competition is well underway. Gloucester and Wingham Rotary Clubs have now held theirs. Another candidate will come out of Forster/Old Bar Club tomorrow night. Taree North will be holding their Public Speaking on Wednesday night. Cluster level will be held at Wingham on 21 November 2017. District level at Walcha on 17 February 2018 Finals at District Conference on 9 - 10 May 2018. Murray also advised that the Battery Muster is doing well – 35 batteries in stock so far. The Committee is currently organising press releases and photos. Kevin Sharp reminded everyone of our Australia Day and Golf Day commitments in January 2018. There will be the provision of the free breakfast and morning tea being held at the MEC. Volunteers will be required. The Golf Committee will now organise to canvas business people for sponsors. Susie advised of the Bunnings BBQ Fundraiser which will be held on 18 December 2017. This is a Monday and we will need volunteers for this BBQ. Bunnings BBQ dates are now available for next year. Monday night was also a Melbourne Cup Fundraiser and it was hoped that many would wear hats, or something representing our prestigise Melbourne Cup. We did have a couple of members who dressed up and looked quite dapper, a couple of quirky ties were on show, but only a couple of people wore hats. A prize was presented to Ted Gauntlett for his hat. Well done also to Sandi Outtrim and to Kevin Sharp for his Japanese riding treads.